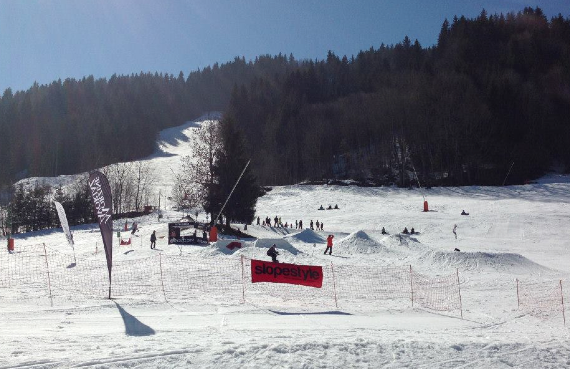 The sun was shining on the second annual Slopestyle Rhythm Sessions held on the piste to the back of our Hotel L’Aubergade yesterday and it was another absolutely epic day. With an outside bar, pulled pork, Morroccan lamb and scorching sunshine, spring has definitely arrived and it was the perfect complement to an awesome event. This comp is different in that it’s creativity that wins the prizes and with one of this year’s limited edition Volcom team snowboards up for grabs as an incentive, the competition was tough! With the help of a great team of volunteers and of course the fab pisteurs for gathering the snow up, there was a brilliant course. Thank you to everyone who took part and came to support us, we’re already looking forward to next year! Next: Surfdome and Mountain Mavericks Competition Winner Announced!